Mothering from the Maelstrom: That's It? 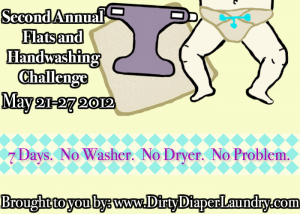 Last year the Flats and Handwashing Challenge was exhilirating. It felt challenging and exciting and like a real accomplishment. As I finish this year's flats challenge, I'm left feeling a little, "meh". Last year flats were a whole new world for me, but this year, they're old hat. I've been stuffing my pockets and covers with these little darlings for a year now so it's no big whoop. I had everything I needed already on hand so I didn't even have to prepare for this year's challenge at all. I just woke up Monday morning, slapped a flat on Ivy, and went on with my day. At bedtime I stuck the dirties in a bucket of water and soap, went up and did the bedtime routine with the kids, then came back down and scrubbed and rinsed for about ten minutes. Not very challenging. I didn't even set up a clothesline - lazy old me just hung them on the porch chairs and railing overnight and they were still there and plenty dry by morning. I'm not saying handwashing is easy. Spending an hour washing and hanging a big old bucket of flats that I had been neglecting for three days as I was trying to get the car packed for our weekend away was no picnic. But it wasn't a big deal either, just a bit time consuming. And the pinnacle of my nonchalance about flats - when at the last second my mom said she would watch Ivy while we took the big kids on vacation, I said "Thank you thank you thank you!" and headed out the door. I didn't leave her any instructions or alternate diapers or anything. Ooops! But never fear, she was around last year for the Walmart Flats Challenge so not only did she rock the flats, but she also knew that when she was running out of flats Sunday night, she could put the baby to bed with a receiving blanket in her cover. The highlight of the challenge I think. But, while the whole thing does seem a little anticlimatic, I think this is a good thing. Because really, flats shouldn't be a big deal. People used to use them all the time without any fanfare or patting themselves on the back. And I think that's what we need to get back to. While I do love me some fluffy mail, and I could talk for hours about cloth diapers with anyone who asked, I think that the future for cloth diapers is banality. I mean, these are diapers. They catch poop. Do you chat with your mom friends for hours about disposable diapers? How about baby socks or onesies? Nope, because it's no big deal. It's ordinary. You might recommend your favorite brand, but there just isn't that much to say about them, because how to use them and wash them and dispose of them is common knowledge. You don't have to wonder where to buy them, you know because you've seen them at Target a thousand times already. And that's the place that we want cloth diapers to be. We want them to get to the point for mothers around the world where we no longer need advocacy groups. Where moms no longer feel the need to congregate in online groups to discuss in minute detail washing routines and fabrics and fit because they can chat about those things with the mothers around them in real life if they're having trouble. I can't wait until we reach the day when new moms learn everything they need to know about cloth from their own mothers or from the childbirth prep class at the hospital, along with the other basic baby care knowledge.